Thanks for the update...kinda disappointing we have to wait so long...game will be sitting on shelf until then lol. LOL what??? this is a MOD. The Valley is a MOD. The Ridge is a MOD. 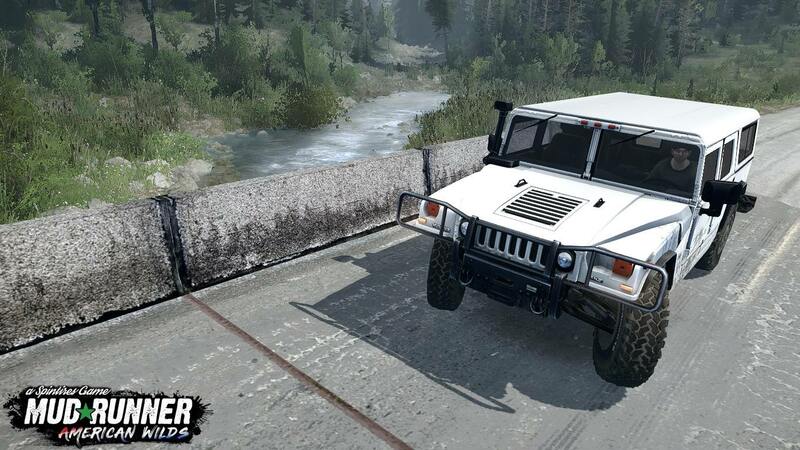 The 5 vehicles that came out besides the base game are MODS. Man why does no one get that? So base game was $15.00 USD. All DLC/ MODS were FREE. Just because it's not a lifted chevy or dodge, doesnt mean it's not a MOD. What does MOD mean? It means MODIFICATION to the Vanilla game. What do you guys expect? No mods for consoles, ever, Why? because it is too tough to put an editor on console. Ok dont ask why, it is what it is. @rufus I know youre one of the cooler guys here, but he said "will be released this fall"
He also said "American Wilds will come with many features that you have been asking for"
Sowhat are some things you guys have been asking for? Also, the American Wilds pic that circulated the internet, if you look at it closely, is not a screenshot of in- game footage, but a sketch/ artwork. Why all the hostility? Look at Bethesda's Fallout 76. It was announced prior to E3, at E3 their spokesperson said "pre- order to be included in the BETA" then 6 weeks later they come out and say "Fallout 76 will be released Nov. 14th. The BETA will start sometime in october, and we will be randomly selecting players, then as time goes on more will be able to participate"
their response/ They banned me from the entire site for 27 YEARS! Yes, when i visit the site, wont even load the home page, says "Your Suspension Will End DEC. 14th 2045"
I told you all that little tidbit, because Bethesda is an AAA dveloper, FOCUS is a small team from what i understand, yet they do not treat their customers like garbage. So in return, say "Thanks for the update, will be looking forward to it's release in the fall and please if you have anything to share going forwards, please do"
@1967deuce I hear you bro, but please, understand that Focus is not the one developing the game. They are publishing it. Also, bad examples are not to be followed, so of course Betheshda attitude is not to be followed. I'm happy with the devs so far, but monthly updates, as much as I want be fullfiled, I'm just not. They did not even take the time use another screenshot for the post. Just the same one. How much time you think it took to make this monthly update? I've seen this screenshot like a hundred times now. Please, understand that I'm only asking because I care. Sorry for my english, I'm from Cuba. You sold more than million copies of the same game twice and you have no money for a decent team that would develop the game properly and quickly? $30 x 1,000,000 = $30,000,000 right? You think thats alot of money right? The list goes on and on and on. By the way all these overhead costs are on a monthly basis. At the end of all the overhead, that $30,000,000 turns into maybe $10,000 maybe less. So It would make sense if FOCUS has like 20 employees, it costs alot of moolah to run a business. You know Rockstar, the people that made GTA? They have over 1,500 employees, I think its like 6 or 7 studios across the globe. Thats why yopu see stuff coming out for GTA every other week. Or Avalanche Studios- they made Just Cause, they have 3 studios, and maybe 100 employees, this is why they put out a game every 3-4 years. @1967deuce yeah! with U on that!. Also note that Saver Interactive are the ones developing the game. It's a very small studio. It's admirable what they have accomplished so far. I keep forgetting FOCUS is the publisher, thanks. And your english is very good, no worries. I'm glad you understand what I'm saying. I thought the update was abit vague too, but I'm sure @Iyagovos is very busy, so far i have seen Iyagovos, Netheos, and Sodoma as mods in spintires forums, if that be the casse then 3 mods in undertstaffed. As for the developer, his name is Pavel right? I have no seen him post here in a very long time, would be nice to get a word from him. What needs to happen, is representatives from Saber need to make a sticky post, stating how big their studio is, whether or not working there is a Full time or Part time gig, how many employees there are, etc. Because from what i've gathered, i only know of pavel working there as he is the creator of Spintires right? I've found old posts of his and yeah he seems like a very classy guy. And exactly, for all we know he has been living on energy drinks slaving over the game. One thing i love is how he figured to get the graphics and physics to work so well, meanwhile the base game is less than 2 GB. GTAV with all the DLC/ Updates is over 100GB which is outrageous. @1967deuce I've been playing games my entire life, since I was a kid. Now I'm 26 and I've learned that you can say much with simple but well thought things. Pavel archived amazing physics like no other game almost by his own and graphics wise, it's impressive too. It's a shame that he had to go through what happened with oovee. I admire him for keep pushing forward & fighting to make his dream go upward. Hope my english makes sense to you! He also found an empty market share cluster. Spintires Mudrunner is one of a kind. what happened with oovee? was that a previous developer he worked at? @1967deuce Yes! It's not official, but rumor has it that Oovee did not pay him according to the contract and the game was left abbandoned for a long time due to this Dev-publisher "fights"
Finally he left oovee and managed to re-launch it with Saber Interactive under Focus Home publishing. hurra for the 1992 crew!! Might get you up to speed. Everyone calm down Is not the real deal but this is how the game should look in my opinion. @orlando-boom and what I'm talking about, where did you get this my friend, a light at the end of the tunnel was opened, that's real? @fabio-brasil No is not , but is a DLC so don't expect major changes .You guys asked for pictures so I got one for you. The final version will look a little foggy than this but you get the point . @1967deuce i totally pegged you for another guy in his forties, haha. I guess i'll be the board's grumpy old guy unless someone else wants to use his/her cane to get these trophy trucks off my lawn.